« Departure from the HERD as you know it..AND pave your own path! 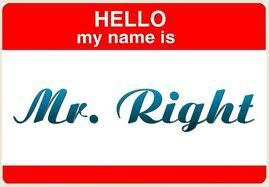 Mr Right or Mr Almost Right? I am always reminded that there are always two sides to a story, yours and his …. then somewhere in the middle is the truth. My question to someone uncertain if they are in the right relationship for them is; when you are thinking about your future that you have full power to create, do you see them in it? And…my next question is, when you really sit down and think about how you want to feel when you are married/committed some day… share with me what that feels like and do you feel like this when you are with him? The past is best left there, in the past all you have is NOW and your power to create the future….so consider the questions I have asked you above, know that there are millions of potential possibilities out there for you…get clear on what it is you want from a partner and relationship and then go for it. If they do not fit your picture, then let them go so they too can fulfill their own picture. With a clear picture you will attract the person that is right for you. Always BE genuine, honest and open. If you maintain this, it will keep you on track. This entry was posted on October 22, 2012, 2:03 am and is filed under Relationships. You can follow any responses to this entry through RSS 2.0. You can leave a response, or trackback from your own site.